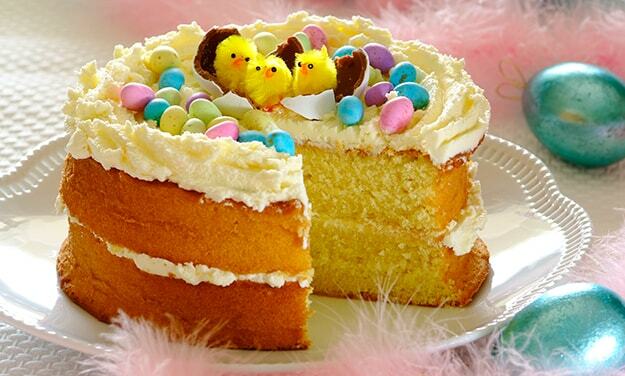 Need a cake recipe for Easter? Try this Easter basket with eggs recipe for a delicious baked treat today. Stork – love to bake. Cream Stork Bake and sugar until light and creamy. Fold in sifted dry ingredients and water in two batches. Beat egg whites until stiff and fold into cake mix. Pour into two greased cake tins and bake for 45 minutes, or until firm to the touch in the middle. Leave in the tins for a few minutes before turning onto a wire rack to cool. Beat Stork Bake until soft and as white as possible then add the cocoa. Add the icing sugar a little at a time, beating well. Sandwich the two cake layers together with a little icing then cover the top and sides with icing using an icing tube. Alternatively, make patterns around the sides with a fork to look like a basket. Arrange some small chocolate Easter eggs in the basket with any other Easter decoration you may desire.